An accomplished actor and comedian known for his trademark deadpan style, Marvin Kaplan WAS wholly committed to his craft. His filmography includes hundreds of film, theater, and television credits. A prolific playwright and enthusiastic producer, Marvin recently executive produced a full-length film, Watch Out for Slick and wrote the book and lyrics of a wild west musical, A Good House for a Killing. 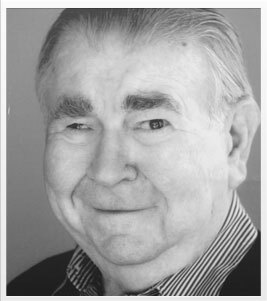 In the following interview, Marvin Kaplan shares thoughts about his start in Hollywood, his movie, and his dedication to the theater arts. How were you discovered by Katharine Hepburn? I came out to Hollywood in 1947 to pursue my goal of playwriting and radio writing. I went to USC for a Master’s degree in theater. I took several courses and wrote a one-act play, which was well received: Death of an Intellectual. (This was before Arthur Miller’s Death of Salesman.) One day, William DeMille, the older brother of Cecil B. DeMille, said to me, "Mr. Kaplan, you’ve taken all our theater courses, but I advise you to drop out of school. Don’t pursue your Master’s degree right now. Instead, get a job in the theater as an assistant stage manager. See what actors do to writers’ lines!" There were only a few playhouses at that time, and I got a job at the Circle Theatre as the stage manager of a play called Rain. The director was Charlie Chaplin. I stage-managed the play for several months until closing. Now that I was a member of the Circle Theatre, I could audition for the next play, a French farce by Moliere. I read all my lines with a Brooklyn accent! The director, Mabel Albertson, thought my delivery was so funny, she gave me the part. I got mixed reviews, like "his awkwardness may seem deliberate, but we doubt it." In the ninth week of the production run – it was a Thursday night – Katharine Hepburn came to the show. She stayed afterward to talk with the cast. She was absolutely gorgeous – so fresh, sweet, alert, and alive. I loved her, and I loved her movies. Miss Hepburn came up to me and said, "You’re Marvin Kaplan, aren’t you? Have you done a lot of work?" I admitted that, no, this was my first job. "Well, you were awfully good," she said. There was something about her – she was so pretty, beautiful, and fresh. I knew it was fresh of me to say this, but I said, "You remind me of my sister. You both have red hair and freckles." She replied, "Yes, this damn sun!" When I came to rehearsal the next day, there was a note on the bulletin board for me: "Call MGM." I thought it was for a page job. I called at noon, and they told me to be at George Cukor’s office at 3:00 for an interview – that was three hours away! I took a bus home, dressed, and took a cab to Culver City. I arrived at five minutes to 3:00 and went to the talent department. They looked at me like I came to do the books! They sent me to the Irving Thalberg Building and Mr. Cukor arrived at exactly 3:00. Mr. Cukor said, "Katharine Hepburn is your agent – she recommended you for a part in a movie." He described the movie, which would come to be called Adam’s Rib. And he described the part I would play: a court stenographer taking testimony in shorthand. He explained, "You repeat this very emotional testimony in a dull, flat voice." I said, "I have a dull flat voice." And that was my interview! It was 1949, and I was 22 years old. I was a baby, I knew from nothing! I went to see my agent to sign the papers. First thing he did was turn down the job! I was new in the business and green as grass. He knew they would want to offer me scale, and it would be very hard to get raises from that. After some nerve-jangling negotiations, the part for Adam’s Rib finally fell into my lap. What was it like to work with Katharine Hepburn and Spencer Tracy? On the first day on the courtroom set, Miss Hepburn came up to me and said, "Here’s where you sit for the next two weeks." She was more than kind to me. My dressing room seemed like a couple of miles from the set. One day, I came on the set and was told they needed a close-up of me. But I had worn a different suit in that shot, so I raced back to my dressing room to change. I bumped into Miss Hepburn on the way, who started to chat. I abruptly said, "Can’t talk now! Gotta change my costume!" and ran to my dressing room. Apparently the director began mumbling about me being late for the shot, and she piped up, "He probably dropped dead, he was running so fast to his dressing room." Katharine Hepburn got me that job – and she probably saved my job too! I remember Spencer Tracy as a man who loved to play practical jokes. At the end of the courtroom scene, I congratulate Miss Hepburn’s character, but I don’t congratulate Mr. Tracy’s character. I had to go through a door, and he pretended I had hit him in the back, as if I had killed him! After the take, I apologized like crazy. He saw the blood go out of my face and grinned, "That’s all right, Kid. Just don’t do it again." Spencer Tracy played tricks on everyone! Hope Emerson played the circus lady. In one scene, she lifts Mr. Tracy (who’s on an invisible wire) and holds him up with one hand. Mr. Tracy gave her a hard time, and she got red in face, pulled her hand away, and left him sitting in mid-air. It was hysterical! When the shooting was complete, Miss Hepburn called me personally and invited me to the cast party. I was only one of two supporting actors who were invited. I was Miss Hepburn’s protégé. I didn’t have a car, so I arranged to go with a script assistant to Mr. Cukor’s house, which was very elegant. Miss Hepburn was wearing a long red dress, and she walked across this huge courtyard to greet me. "I’m so glad you could come," she said. I nearly fainted. She was that kind of woman. Marvin, what have you been working on recently? Last year I executive produced and wrote the screenplay for a full-length film, Watch Out for Slick. I wrote a couple of songs, parodies, for the show. The reason I made this film – and invested in this film – is because it’s my stimulus package to give older performers employment, some money, and some good roles. The average age of the cast is 70-plus. They’re terrific actors with long lists of credits. I’m hoping Slick will serve as an example to other filmmakers to use actors over 50, 60, and 70. We even have an actress who is 98 years old. They were terrific. They come to the set on time, know their lines, their craft, and can still do it in one take. It only took 15 days to shoot a 94-minute movie. So far, Slick has been accepted into nine film festivals and has won several awards. There’s a real ageism prejudice about old people these days. But older actors are damn good. I love good actors. I worship good actors and actresses. But older actors have a rough time getting jobs these days, me included, because the business is youth-oriented. Everything I do is for older actors! I recently wrote a theatrical musical, adapted for radio, A Good House for a Killing, which is about a Shakespearean actor in the Old West. It was performed for the first time by the California Artists Radio Theatre in July 2011. Peggy Webber, veteran radio performer, directed; and she’s 85. The nice thing about growing old is, I can do whatever I want. I can write, direct, and act occasionally. Right now, I’m working on a screenplay, plus I have a wonderful idea for a television pilot. I’m in a very creative mode! You started out as a playwright and now you’re writing again. Is that correct? Yes, that’s correct. In fact, if I could do it all over again, I would have concentrated on writing earlier in my career. When I came to Hollywood, I was initially hired as an actor – and then it was difficult to be taken seriously as a writer. I like to watch old movies, and a favorite writer/director is Preston Sturges. He was a very talented man. Two of his movies were The Miracle of Morgan’s Creek and Hail the Conquering Hero. In his movies, an innocent person makes one mistake, then the whole world falls in on him. And that’s what I do in my playwriting – something happens to an innocent person, then things get out of control. In Slick, the lead character tells one lie, then the whole situation caves in on him. The other thing my movie says: Nothing is what it seems. It seems there isn’t too much to laugh at these days. So I don’t want to do heavy drama. Another project I’m working on right now is Looking Up, a full-length screenplay. It’s an outlandish black comedy. Marvin, do you have a philosophy about acting – and about life? Both Jonathan Winters and Charlie Chaplin gave me the best advice of all: If what you’re doing is funny, don’t be funny doing it. This works for everything, from acting to writing. Whatever you’re doing, there’s a truth behind it. You’re better off telling the truth. And it’s easier to tell the truth. Also, I think funny. And I don’t take things too seriously. In fact, I love the play You Can’t Take it with You. As you live your life, you learn that the things you give away are the only things you really can keep. There’s a reward in giving away things. You can hold on to them that way. I’m very lucky. I have a wonderful support group of high-energy collaborators and actors – talented people who are great at their craft. I recognize that I’m a very lopsided human being! I’m very committed to my craft: writing, acting, theater, and film. I have a good life, but I made it for myself. You gotta make it for yourself. Long ago, my composer, Richard Loring, who died in 2005, told me, "Go where you are honored." For me, that means living and working where you are liked and respected. That way you won’t feel exploited.